Ebola Outbreak - Are We Really Prepared for This Pandemic? Mama Mwatatu rises early and makes a two-hour trek from her home in Beni’s Cité Belge neighbourhood in North Kivu to the local radio station, where women inundate her with questions about the deadly disease. 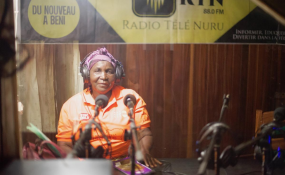 Twice a week, Mama Mwatatu rises early and makes a two-hour trek from her home in Beni's Cité Belge neighbourhood in North Kivu, the Democratic Republic of the Congo to the local radio station. For the past 12 years, she has hosted a call-in radio talk show called "Women and Development" and has a devoted audience, earning her the nickname Mother Counsellor of Beni. In normal times, she dispenses advice on health, relationships and child-rearing. But since this August, Ebola has shaken residents and the city is the base for outbreak response efforts in North Kivu. Mama Mwatatu's mostly female fans have inundated her with questions: Why aren't you talking to us about this? We don't know what to believe. But if you tell us that Ebola exists, then we trust you. "I told them: 'Ebola is real, and you have to protect yourself and your family,'" Mama Mwatatu says. "But I wasn't sure I had all the answers to the more technical questions so I got in touch with the World Health Organization (WHO) for assistance." And so Mama Mwatatu teamed up with WHO's community engagement team and her two weekly shows expanded from 30 minutes to an hour. The current Ebola outbreak in the northeast of the DRC - the tenth since the disease was identified in 1976 - has stood out as the country's largest. Response efforts have been complicated by insecurity and armed conflict. Another challenge is how this outbreak has disproportionately affected women. "It's the first time in an Ebola outbreak that so many women have been infected," says Julienne Anoko, a social anthropologist working for WHO. "We've never seen this before." In Beni, it's the women who run the households. They look after the children and they care for the sick. If a mother herself falls sick, she'll hand over her children - who may possibly already also have Ebola - to a neighbour who will mind them along with her own. This is one way the disease has spread. "We discovered that women are very reluctant to let the sick go outside the home for treatment because, to them, that signifies they've failed in their duty to look after the patient," says Ms Anoko. "At the start of the outbreak, local women saw these men in jackets doing 'Ebola business' and thought, this doesn't really concern us," explains Antoinette Zawadi, CAF's coordinator. "Then as women leaders from Beni became involved, other women started to listen. They said, 'OK, it's between us now.'" "We've done a lot of work to sensitize people about Ebola and they have understood," she says. "But I think outside of Beni city, in the wider district, there is more to do." Ms Anoko agrees, emphasizing that it's important for women to stay vigilant in Beni, while WHO duplicates what's worked there with women in the new Ebola hot spots of Butembo and Komanda. "I really want these women leaders at the senior management coordination table helping to drive the response," she says. And if any of her listeners aren't convinced by the radio broadcasts, she follows up with visits to their prayer groups and other women's meetings. "Yesterday, I didn't have a broadcast and so I visited a number of towns," Mama Mwatatu says. "I do this just so I can help because I am passionate about it in my heart."